This morning I received two Father’s Day cards … One from my 12 year old son and the other from my faithful Golden Retriever “Lucille.” There’s nothing better than getting a little recognition on this special day. I also got the afternoon off to do as I like. So what am I doing? Well … spending my time reading, writing and listening to music of course. I find it relaxing and therapeutic. certainly brought the swing out of the closet. The band formed in 1989 and was essentially comprised of dropouts from the University of Oregon. Frontman Steve Perry went in a totally different direction from the popular grunge sound of the time. 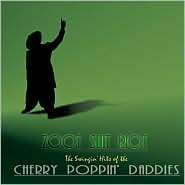 The name “Cherry Poppin Daddies” was intentional and was created as a way to honor the cartoonish Dixieland recordings which inspired the rest of the band. The word on the street was starting to spread as The Cherry Poppin’ Daddies wild and over the top shows would stir controversy and protests outside their shows. They released their self-produced debut, “Ferociously Stoned” in 1990. The album was strong enough to generate a following and a future for the band. The band did two more albums, but it was this album in 1997, a compilation disc featuring all of the swing stuff from the last three albums and four brand-new tracks including the incredibly popular Zoot Suit Riot that brought them major success. The song and the video would give them a nomination for a MTV Video Music Award. Unfortunately the swing revival and the group’s mainstream popularity ended within a few years. Perry publicly blamed the record company’s mismanagement for the band’s slow decline. After 2000’s Soul Caddy, Mojo Records dropped the band and they would have a period of inactivity for seven years while Perry worked on his degree in molecular biology. The band continues to tour and sell out smaller circuit shows wherever they perform. 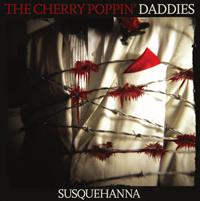 Susquehanna their newest release is available on the band’s website for hard copy CD purchase or digital download … You can get more information on the band and their latest tour directly from The Cherry Poppin Daddies Website by clicking here. My father loved big bands and swing music. I’m sure he would have enjoyed listening to The Cherry Poppin Daddies and would have found the short swing wave that the group rode very interesting. The band’s onstage antics probably would not have been his bag, but that’s not what this post is about. It was a quick peek into my crazy reflective “what if” mind. So what music set the tone for your Father’s Day? Did you have the opportunity to relax like I did? If so … what were you listening to? Better yet, what did or would your father have listened to on this day?